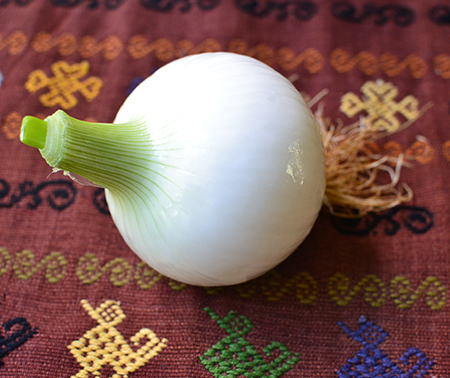 When you travel to exotic locales, do you find yourself buying intriguing local produce at the farmers market? Perhaps you even do that at your local market. When we first moved to the Southwest, that is what I did. 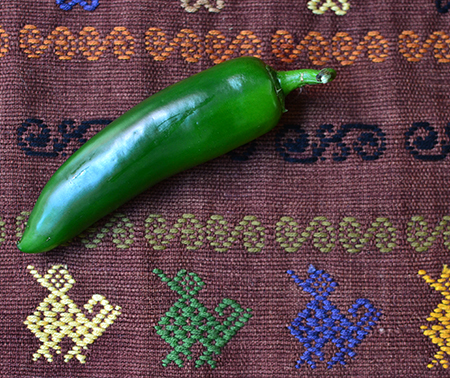 Whether at the farmers market, or in the grocery store, if I saw something distinctively Southwestern, or unusual, weird, or completely unfamiliar, I bought it. I remember the first time I bought tomatillos. I had heard of them, but had never seen them. I loved their brittle paper jackets and bought eight of them with absolutely no idea what to do with them. They came home to our kitchen, and then sat there doing nothing. I guess the allure gave way to uncertainty. Mark kept pushing me to do something with the tomatillos so they didn't go to waste. I suggested that he find a recipe and I would cook it. And that he did. He found a Rick Bayless recipe for fish with tomatillo salsa. Bayless' recipe was a contemporary take on a traditional Mexican recipe, and my version takes it a few steps further from the traditional. It has ended up being one of our favorites, and each time we make it (like last night) we ask ourselves, "Why don't we make this more often?" It is basically a Mexican fish and chips, but it is so much more than that. The chips are not French-fried potatoes; they are the crust of the fish. 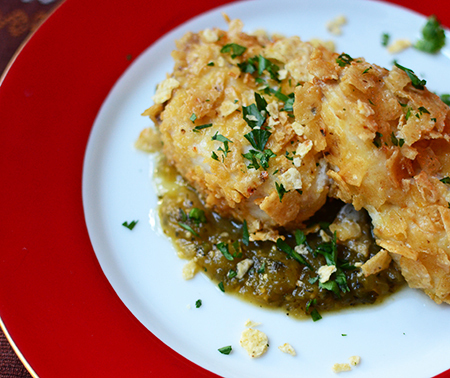 The tomatillo sauce is just perfect with the buttery-flavored fish with its crunchy coat. And, yes, it is fried. I don't like to fry indoors, especially when it is fish. In a small house, all you can smell for days is the fish and then, for days after, the oil. Instead, I use the side burner on my outdoor gas grill to fry the fish, and the covered grill, set to low, to keep the fish warm and crispy as I cook it in batches. 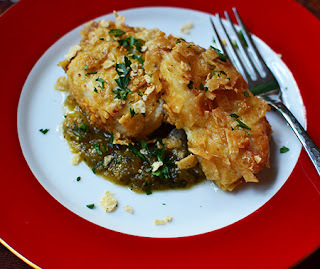 This does mean that I have to disappear from the dinner table for a few minutes to do the final cooking, but Markipedia keeps the troops entertained until I am able to enter with the platter of golden-fried fish on a bed of tomatillo salsa. I don't recall anyone complaining that I was gone too long! They were too busy cleaning their plates. Make sure your grouper is cut into equal-sized pieces. You want it to be about 1 1/4-inches thick. 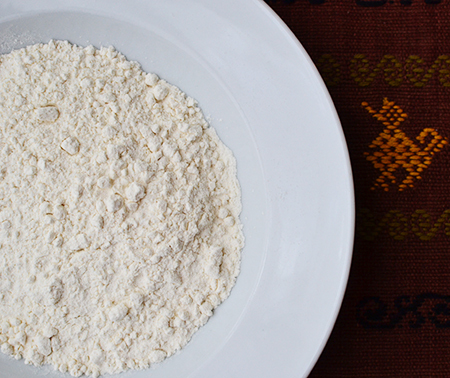 Place the flour in a shallow bowl, and stir in 1/2 teaspoon salt. 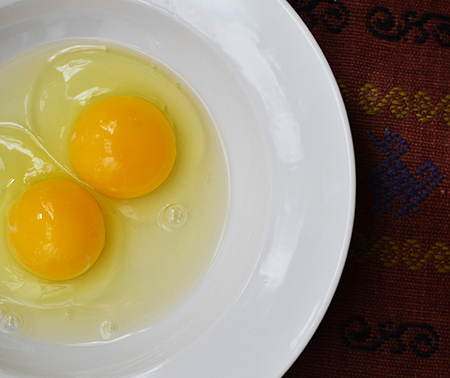 Place the eggs in another shallow bowl, and whisk them together with 1/2 teaspoon salt and 3 tablespoons water. Using the bag in which the chips came, crush them until they are about 1/4-inch in size, although some largest pieces are nice, too. 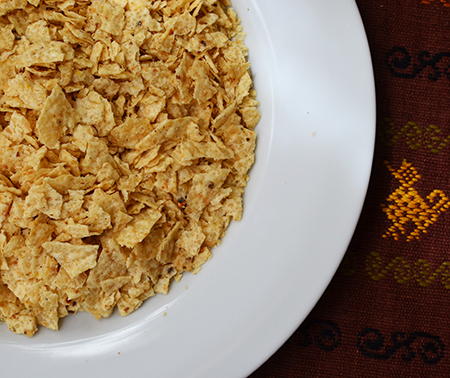 Spread these crumbled chips on a large plate. 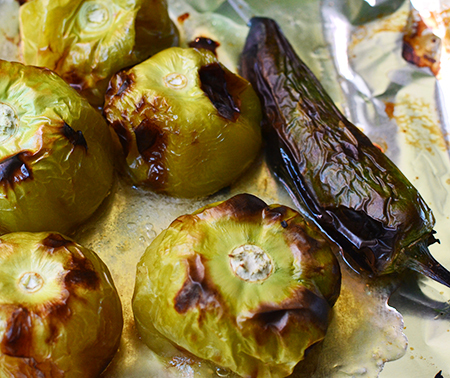 Meanwhile, peel and discard the papery tomatillo husks, rinse them, and place them on a foil-lined baking sheet. Add the jalapeño pepper(s) and place under the broiler - as close as possible - for 8-10 minutes, until they begin to char. Turn the vegetables, and char the bottoms for another 6-8 minutes. Place the charred vegetables, and any accumulated juices, in a blender and purée till smooth. A few chunky bits won't hurt. In a large saucepan, heat the olive oil and sauté the onion over medium heat until it is golden, stirring often. Increase heat to medium-high and, when sizzling, add the tomatillo purée. Cook for about 5 minutes until the color is darker, and the mixture has thickened. Heat the oil in a large skilled over medium-high heat. 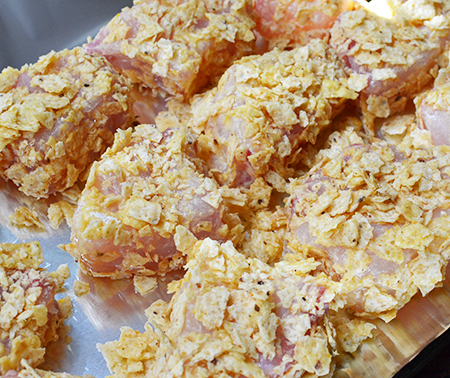 Place a baking sheet, lined with foil, in the oven and set to 300°F. (I set my gas grill on low, and set the lined baking sheet directly on the grill with the lid closed.) To test if the oil is ready, take a small piece of the fish crust and drop it in the oil. If it sizzles, you are ready. Place half the grouper pieces in the oil and fry for 2 minutes per side. Remove them from the oil and place them on the prepared baking sheet. Fry the remaining pieces, also for 2 minutes per side, and then place them on the baking sheet with the other pieces. Leave them to keep warm until you are ready to plate. To serve, divide the sauce among six plates, and place a piece of fish on the sauce (or two pieces, if you made them smaller like I did). 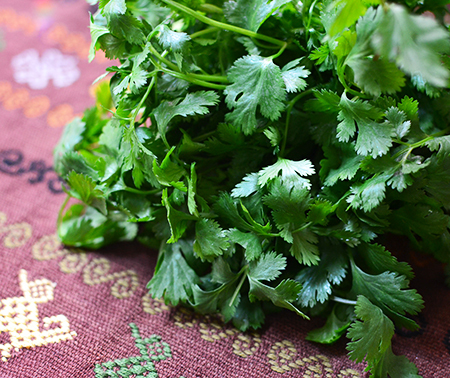 Top with chopped cilantro or a sprinkle of diced bell pepper for color. This looks and sounds like such a delicious meal! I love fish and these flavors are like home for me. There are beautiful pictures with great colors in this post, David! Thanks, Marcelle - don't you love when food brings "home" to mind? I guess that is the definition of comfort. Thanks, Greg - nice to mix things up now and then. What a fab way to serve 'fish and chips', David. Love it. What do tomatillos taste like? Sorry, Liz – I'm behind in my comments. 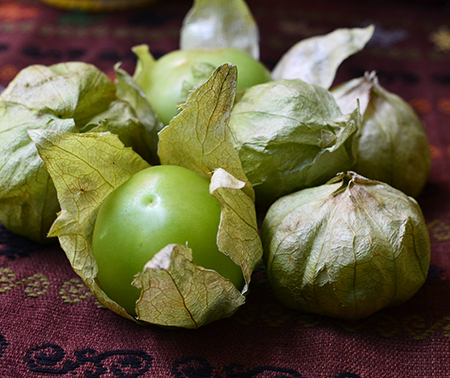 A tomatillo taste a bit like a green tomato, yet meatier and a bit sweeter. This looks fantastic! I do love a good fish and chips and though this is very different, I think I would have no problem eating this up. It was absolutely wonderful seeing you on Thursday. It wasn't enough time because I didn't get to tell you everything I wanted to! Even though we talked for 5 hours straight, it still wasn't enough. Come back and visit soon. I guess in the meantime, we can call each other. Obviously, five hours wasn't near enough time to spend together! We look forward to another visit to Denver soon. I think you would really like this fish and chips, because the tortilla chips add a wonderful crunch. Thanks, Caterina. Are you able to get any good fresh fish where you are? 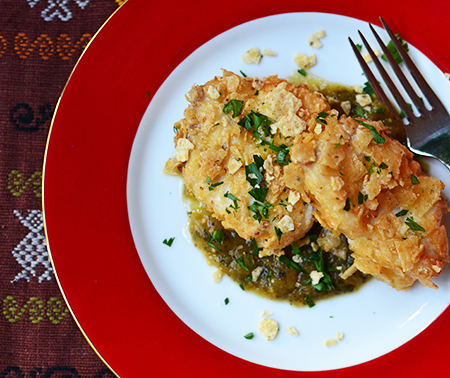 Mexican salsa verde really does make just about anything taste better, doesn't it? I remember having it for the first time back in the 80s... I was hooked at the very first taste. Frank – I think salsa Verde is probably my favorite, but this one takes it to a new level! Definitely worth trying. A great name for this recipe, love your take on it. Thanks Caroline! Can you get tomatillos in your part of the UK? This sounds "to die for" as I love tomatillos and love the idea of using chips for the crust. What wine would you recommend? Susan – sorry for the late reply. I think a full-bodied white wine is perfect with this dish, but a rosé would work pretty easily as well. Love the idea of a crunchy tortilla crust--and I'm a long standing salsa with fish person. I don't see tomatillos here a lot, so some years have grown them myself. We grow tomatillos at the Honors College in Tucson! Some years, it's just too hot here and they don't make it to fruit. I imagine you have a much better time in Wisconsin. When we were staying in NY a few years ago I did exactly the same thing. Tomatillos were everywhere and I bought some to cook with in our apartment. I really like what you've done here! I just wish we had a kitchen on our current trip! Sounds wonderful, David. If I'm staying in a flat when out-of-town, I always head to the nearest produce stand/market and then cheese shoppe. I may not be overly adventurous but it sure is nice to have fresh fruit and cheese around for snacking. I only recently used tomatillos to make salsa and will be sharing that recipe in a couple of weeks. My recipe is far simpler and I cannot wait to give yours a try. It sounds quite flavorful. It sounds like we travel very similarly, John. I'm looking forward to our trip to the UK and Paris this winter, to see what's in the markets. I'm hoping for truffles… And maybe a few more Porcini mushrooms! Haha! I was looking for potatoes in your recipe and then realized when you said fish and chips, you meant tortilla chips! What a concept! I love fried fish (but yes, like you, the odor is the worst)! Lovely recipe and I rarely use tomatillos, myself. Need to use them more often! Christina, this makes me wonder if tomatillos are used in non-American (North, Central, and South) cuisines. I tend to think not, unless the chef is doing fusion work.